More info:Prices based on 2 adults sharing. From $1080 - $1390 per child inc UK flights. Mimimum age 7. On this tour, we are able to benefit a wider range of people then conventional tourism by providing a helping financial benefit to the region. We support the local economy by using local leaders and guides, staying at different hotels and thus spreading the money across the country. We stay on a bed and breakfast basis and so for most of the meals we eat out at local restaurants, not only experiencing different foods and customs but also aiding the local economy by visiting many different places to eat. With the optional trips, we also try to give as much back to the economy as we take out. We take trips in a felucca and by camels thus providing income for their owners and giving us a great cultural experience. The feluccas of course use only the wind for power - perhaps the most environmentally friendly way one can travel, whilst our focus on responsible tourism gets local people talking about it, which leads to a greater understanding of the reason it is so important. 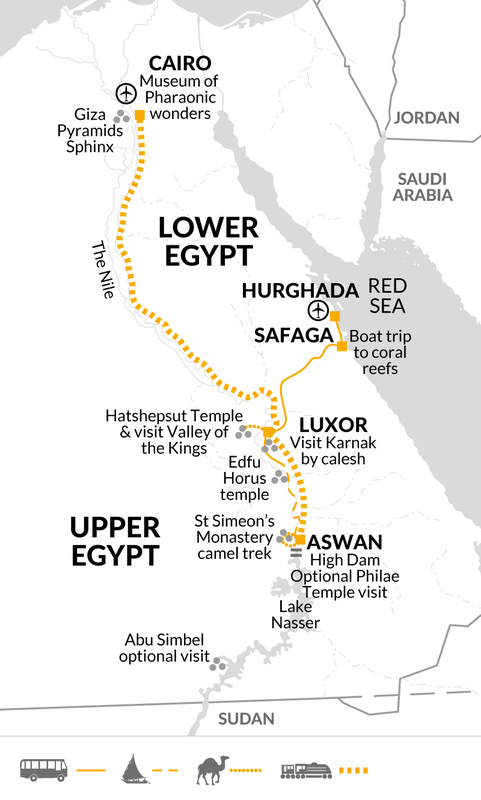 Elsewhere on the trip we travel from Cairo to Aswan by train, further minimizing our carbon footprint. Our Tour Leaders are all trained by us in the importance of responsible tourism with guidance given on how they can make a difference. This then percolates down through those they deal with. The sailing and overnight camping on the feluccas was amazing and my son really enjoyed this. In fact, the itinerary was brilliant and well thought out. I really approve of what this company is trying to do. Make sure your children can snorkel before they get out there. Generally, although I am not sure that the 'tipping' aspect of this vacation was handled effectively despite a 'tipping' kitty being set up. Here is a selection of comments that I would like passed on to the company we went on vacation with. The ideas behind the vacation is amazing and very worthwhile. I am glad that this exists for families to go on and I could see that a single parent could easily be accommodated on this type of trip which is fantastic. I want to recommend this to my companies 'Parents committee' as a great vacation resource. However, here is some aspects of the trip I think really needs addressing. 1. A tipping kitty was setup at the beginning of the vacation by our tour guide. Parents had to contribute for each child as well. This proved a hefty amount of money. However, wherever we went and whatever service we used, it became apparent by the local people providing the service that they had not received a tip and when the guide was questioned he gave conflicting reports as to whether individual should go ahead and tip despite the tipping kitty. My feeling is that the tipping kitty was just pocketed by the guide. Also, all the children were promised prizes from the tipping kitty but these did not materialise for all of the children. 2. Shopping - we were taken to some markets and two shops were pointed out as 'recommended' by the operator as shopping venues. They had hugely inflated prices and when we went to other shops, the guide left us behind in the market which turned into quite a frightening experience. 3. Safety while swimming - (this is really important as I could not recommend something that could prove dangerous) The guide took us to an outlet where once again he was making a cut on the wet suits etc we were renting. He was supposed to check that all the children could snorkel effectively. My son could already snorkel so I was not too concerned. However, the other children were not given enough time to become accustomed to the mask and so on. Also, a number of the parents had never snorkelled and had no idea what to do. The parents were not told to take life jackets for their children on the boat and there were none on board!! The water was freezing cold and he had to be persuaded to get wetsuits. When the children first got in to a choppy sea with at least three other boats moored to the same snorkel spot chaos ensued and some of the children cried and wanted to get out of the water. The guide shouted at the children and told them off for not being able to snorkel !! The episode ended with the tour guide deciding the water was too cold fro him to go into and left 1 boat guide to take the whole group out snorkelling. Luckily for one unfortunate child I decided to go out snorkelling late and found the 11 year old in dire straits out at sea having been left behind by the guide in the sea!! I can forward you his mother's contact details if you need confirmation. 4. We spent an extra 4 days in a hotel (Movenpick) at the end of our tour. Our guide pressurised us into booking a taxi to Hurghada airport with him (as we would not be able to use the pre-booked one as we were returning on an alternative date ). He told us there were no taxis from the hotels and we would need to book or be stranded and demanded the money right away (refusing to give us the option of calling for ourselves from the hotel). Turned out that the hotel had a free shuttle service to the airport so we parted with cash for nothing. Generally the guide has a lot of power as the group is so reliant on him to navigate in a foreign culture and customs. Something needs to be done to ensure safety and a good level of service for what is a great vacation idea. I really value the kind of service and ideas your company offers. The comments were for you to address with the tour operator/ whoever relevant so that the effectiveness of your service is enhanced and so that I can recommend this to my company for e.g. If you would like to publish any part of this feel free. I feel that the safety aspects of the vacation should be looked at closely as it detracts from what is a brilliant vacation idea.